Holyrood’s Justice Committee heard Law Society’s sagging performance. The Law Society of Scotland’s appearance in front of Holyrood’s Justice Committee to give evidence on the proposed reforms of the Legal Services Bill, currently being considered by the Scottish Parliament, seems to prove that despite the Law Society’s well deserved reputation for covering up complaints against its members, covering up frauds, embezzlement, theft, destruction (& the falsification of) documents, client files, mishandling of deceased’s wills, and even covering up criminal acts of its own members, officials from the governing body which ‘looks after’ Scotland’s solicitors are still willing to claim they should be left alone to regulate Scotland’s legal services market, sidelining any real improvements in consumer protection from its members. The usual suspects from the Law Society attended the hearing, President Ian Smart, Chief Executive Lorna Jack (Douglas Mill’s replacement), the notorious Director of Law Reform, Michael Clancy (famed for killing off public petitions, calling in MSPs who are making a fuss about legal matters in Parliament, and someone from the Law Society with the bizarre title of law reform officer, Katie Hay. Missing was the Law Society’s Director of Regulation, Philip Yelland, which was a little strange, as one of the topics which received the most attention was, regulation. Mr Smart was then questioned on how the vote actually swung in favour of Alternative Business Structures by law firms & individual solicitors although he seemed to omit telling the Justice Committee the Law Society had campaigned hard against the vote within its ranks which, as we all now know was eventually pushed through by the larger legal firms and proxy votes. Law Society’s current Chief Executive Lorna Jack – much less fun than Douglas Mill, less prone to animated outbursts too, sadly. The Law Society’s Chief Executive, Lorna Jack, who replaced the fallen Douglas Mill after his ‘secret memo binge against clients of ‘crooked lawyers’ which was exposed by the Scottish Government Cabinet Finance Chief John Swinney during a Justice Committee hearing, managed to get some words in about ‘protecting the legal profession’s independence’ after a question from Committee member James Kelly, initially put to Ian Smart. Plenty there about protecting the legal profession and its members … not much, well .. actually nothing about protecting consumers & clients, which seems to be a carry on from the Douglas Mill days. Michael Clancy had to step in again with further answers on points not emphasised enough by Ms Jack, and also raised the Law Society’s worries over Scottish Government Ministers being able to interfere in the regulator process. Mr Clancy said : “One of the regulatory objectives of the bill is to promote the independence of the legal profession. That applies not only to approved regulators but to the existing regulators under section 86. Furthermore, the Scottish ministers, who have a particular role to play in relation to the approval of regulators, are also captured by the regulatory objectives in section 4, "Ministerial oversight". The trouble is, of course, that ministers are to act in the way that is set out "only so far as practicable". 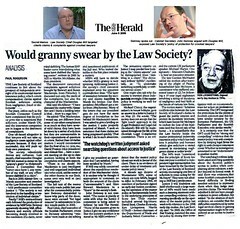 Ian Smart managed another plug for the Law Society’s role in Scottish public life, although it sounds so tired now, we could really all do with a break from Drumsheugh Gardens ruling over the profession and clients best interests, which are never protected, despite the all present’s claims to the contrary. In terms of protecting consumer interests, the Law Society’s appearance before the Justice Committee gave absolutely no hope at all for any expected improvement of standards in a reformed Legal Services market if the bill currently under consideration is passed by the Scottish Parliament, and if anyone is in any doubt about the sub standard of legal services in Scotland, and the poor state of regulation, just watch the clips of the absolutely dismal evidence session from the Law Society, and some of the MSPs who seemed more interested in being seen than being seen to do or say something constructive. Scottish Legal Complaints Commission in the dock over complaints. PERTH SHERIFF COURT will shortly see a first for board members & officials of the Scottish Legal Complaints Commission, who are to appear as witnesses in a case involving Perth law firm Kippen Campbell, who are currently being investigated by the Law Society of Scotland over a complaint made by a client who was being represented by the law firm in a personal injury claim against Arriva Motor Retailing Ltd & Reg Vardy plc. In the dock : Jane Irvine, Chair of the Scottish Legal Complaints Commission. 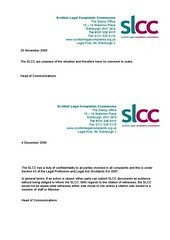 Documents revealed today show the SLCC’s Chair, Jane Irvine and at least one SLCC investigator are to be cited as witnesses to justify their investigation into the Perth law firm after parts of the SLCC’s complaints investigation were filed at Perth Sheriff Court in connection with a legal action launched by Messrs Kippen Campbell against their former client, for alleged outstanding but disputed fees. Fee note released during the SLCC’s investigation shows Kippen Campbell tried to charge for dealing with the Law Society over complaints. The Scottish Legal Complaints Commission began an investigation into complaints made late last year against Messrs Kippen Campbell by their client, a Mr William Gordon over issues related to their representation of Mr Gordon in the personal injury claim. 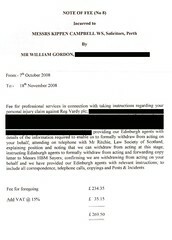 The SLCC’s investigation was ‘complicated’ according to legal insiders, but it has now emerged in court documents seen by journalists that the law firm had, among its now disputed charges to Mr Gordon, charged a fee note to their client for a phone call to the Law Society of Scotland over the actual complaint made by Mr Gordon, an action which sources at the Law Society say is severely frowned upon by the regulatory body as solicitors are ‘not allowed to charge clients for dealing with complaints. Leading figures from Scotland’s legal profession said this evening the move to cite senior officials of the regulatory body as witnesses in a courtroom ‘was unprecedented’ and would shine a much needed light on the poorly performing Scottish Legal Complaints Commission which apparently has yet to show one single success for ‘protecting consumers’ against rogue solicitors & law firms in Scotland. Roseanna Cunningham MSP called in to help constituent’s complaint amid SLCC delays. It has also emerged that Perth MSP Roseanna Cunningham has been called in to help the constituent’s complaint with the Scottish Legal Complaints Commission, after it emerged the SLCC had not apparently fully understood what had actually happened to the client, causing concern the law complaints body had failed to address all the issues put before it, and in a strange twist, a trail of documents between the SLCC and Mr Gordon reveal the law complaints body was slow to involve Ms Cunningham in the loop on the progress of their investigation and findings, despite receiving letters from Ms Cunningham early on in the case. No one was available at Kippen Campbell for comment this evening. My advice to anyone dealing with the Scottish Legal Complaints Commission .. if you feel your complaint has been poorly dealt with, and you are fighting a legal case based on issues the SLCC has considered, make sure like Mr Gordon, you cite the relevant SLCC personnel or even board members as witnesses to justify whatever they have said or done in terms of their investigation into your complaints against solicitors & law firms. Holyrood’s Justice Committee continues to hear evidence from legal profession luminaries. REGULATION OF THE LEGAL PROFESSION was further discussed at the Scottish Parliament’s hearings in to the Legal Services Bill where leading figures of the legal profession itself appeared to give evidence before the Justice Committee after the initial round of testimony from the consumer organisation Which? and the Office of Fair Trading, previously reported HERE. Professor Alan Paterson declared he was against alternative business structures. Professor Paterson told the Justice Committee that in his position on the Council of the Law Society of Scotland, he had voted against alternative business structures along with others resistant to the so-called reforms of solicitors business practices, although the vote was eventually carried through, with large law firms making their views clear they wanted abs to succeed, and the Law Society ultimately had to support it. Among the highlights of this particular session, the Dean of the Faculty of Advocates, Richard Keen, appeared to defeat his own arguments with regard to points raised by the SNP’s MSP Mr Stewart Maxwell on the involvement of non-lawyers in the regulation of advocates. Richard Keen replied, comparing regulation & independence of the courts to that of regulation of advocates and leaving the Committee members in no doubt he was against further regulation of the Faculty. Richard Keen replied, claiming consumers already had direct access to advocates although we all know from anyone who has actually tried to secure direct contact with an advocate, this is an almost impossible task. More coverage of the evidence on the Legal Services Bill will be reported in the next few days, including the Law Society of Scotland’s appearance before the Justice Committee earlier this week. Holyrood’s Justice Committee heard regulation must be taken away from the Law Society of Scotland. THE OFFICE OF FAIR TRADING has told the Scottish Parliament’s Justice Committee the Law Society of Scotland should be stripped of its regulation role, to give better consumer protection in any reformed legal services market, after constant revelations in the media and in consumer groups investigations & public surveys of the legal profession’s constant habit of covering up complaints against the rising numbers of ‘crooked lawyers’ working in Scotland’s many law firms. Office of Fair Trading & Which? call for independent regulation of legal services in Scotland. The OFT, and Which? both reiterated their points that a separation of the Law Society’s regulatory role from the Society’s main function, which is to represent its member solicitors & law firms .. usually against the interests of clients and consumers, when a complaint arises challenging the conduct or service of a solicitor or law firm. Clearly Mr Don hasn’t spent much time with actual members of the public trying to pursue cases through the courts which require the services of an advocate. If he had, he would know his fantastic claim is well out …. Over the next few days, more will be reported from the Justice Committee hearings on the Legal Services Bill, including coverage of Professor Alan Paterson’s evidence, and sessions with the Law Society of Scotland, Faculty of Advocates, and other sections of the legal profession who attended Parliament. Labels: Cathy Craigie, Kenny Macaskill, Law Society of Scotland, Legal Services Bill, Nigel Don, OFT, Scottish Government, Scottish Parliament, self regulation, Which? Scottish Parliament will hear pleas from lawyer to continue regulating themselves. THE JUSTICE COMMITTEE of the Scottish Parliament will tomorrow, Tuesday 15th December, hear pleas from the Law Society of Scotland to be allowed to continue in its role as self regulator of the lion’s share of legal services in Scotland, despite the fact that for well over three decades now, self regulation of Scotland’s 10,000 solicitors by the Law Society of Scotland has led to the lowest standards of legal services in the western world, and the highest number of complaints made against its member solicitors, many involving serious issues of fraud, dishonesty, and almost endemic negligence from many solicitors & legal firms who promote themselves as some of the ‘most respected’ in Scotland's legal services marketplace. The Legal Services Bill, currently being considered by the Scottish Parliament’s Justice Committee, is an attempt to widen public access to justice in Scotland, and also allow legal firms to draw in outside investment, hence the term ‘alternative business structures’, used by the legal profession to placate its desire for more money, but very much less by way of any improvements for consumer protections, which of courses the Law Society of Scotland wishes to keep control of for itself. You can read my previous reports on the Legal Services Bill, once called the ‘Legal Profession Bill’ by the Scottish Government but changed after some smart-eyed civil servant thought it sounded too ‘pro-the-lawyers’, here : Legal Services Bill for Scotland - an attempt at access to justice, or simply to give lawyers more control over justice ? Ex Law Society Chief Douglas Mill’s grilling by an earlier Justice Committee on consumer protections & poor Law Society regulation left Scots in no doubt the legal profession is rotten to the core. Scotland is a distinct legal jurisdiction only because you keep it that way, Mr Smart. Scotland is a distinct legal jurisdiction which does not allow its people unhindered access to justice and access to the courts, simply because the Law Society of Scotland forces anyone who requires access to justice to use the services of an expensive solicitor who is also a member of the Law Society of Scotland. A spokesman for one of Scotland’s consumer organisations today expressed dismay at the Law Society’s attitude towards the Legal Services Bill, claiming the Law Society ‘was seeking to control the entire debate on access to justice and maintain control over regulation’. As an experienced reporter on issues relating to the Law Society of Scotland and regulation of complaints, it is very clear the interests of consumers will only be served by a complete overhaul of regulation of legal services in Scotland, with consumer protection made the first priority, rather than the profession being allowed yet again to maintain the closed shop regulation system which as we have repeatedly seen over the decades, operates a hostile policy towards complaints & disputes between consumers & solicitors. Holyrood’s Justice Committee publishes submissions on Legal Services Bill. REFORM OF LEGAL SERVICES in Scotland is now firmly on the cards with alternative business structures for law firms, expansion of rights of audience, representation and wider access to justice for Scotland’s consumers being considered by the Justice Committee of the Scottish Parliament. However, while the legal profession and some consumer organisations such as Which?, Consumer Focus Scotland, and the Government agencies such as the Office of Fair Trading have given their replies, actual consumers of legal services should consider writing into the Parliament with their own experiences of legal services in Scotland. So far, a total of nineteen received submissions have been published by the Scottish Parliament’s Justice Committee, which everyone who uses legal services in Scotland would do well to read and add their own letter or submission to the Justice Committee BEFORE 18th December 2009 at the latest. Experiences from actual consumers who have used legal services in Scotland, whether good or bad, are vital to help the debate and ensure the new legislation will help consumers rather than protect old monopolies held by the legal profession over individual’s access to justice in Scotland. For specific information on the Bill, please contact Andrew Proudfoot, Assistant Clerk to the Committee, on 0131 348 5047 or email lsbill@scottish.parliament.uk or justice.committee@scottish.parliament.uk with your written submission. Labels: Consumer Focus Scotland, Justice Committee, Law Society of Scotland, Legal Services Bill, OFT, Scottish Parliament, Which? Lord Woolman grants second use of a McKenzie Friend in Scotland. 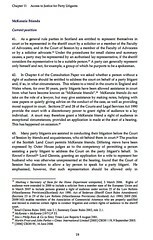 AFTER FORTY YEARS of McKenzie Friends being kept out of reach of Scottish courts, a policy which was quietly broken by Lord Woolman's mid November ruling in Wilson v North Lanarkshire Council & Simpson & Marwick granting Scotland's first use of a McKenzie Friend, the same judge, Lord Woolman has now allowed a second use of a McKenzie Friend in a legal action involving a party litigant, Mr Andrew McNamara against the Edinburgh Law firm Tods Murray LLP, who were previously linked to the former Scottish Conservative Party leader David McLetchie MSP. Mr McLetchie as readers will remember was forced to resign from his position as Scottish Conservative leader on 31 October 2005 , after an expenses scandal over taxi fare claims for journeys which apparently involved trips to his former law firm. Mr McLetchie resigned from Tods Murray in early 2005 before the expenses scandal made the headlines. A spokeswoman for the Scottish Courts Service today confirmed that a McKenzie Friend was allowed by Lord Woolman in the long running Court of Session action of [Pursuers] TODS MURRAY v [Defenders] (1) ARAKIN LIMITED; and (2) Mr Andrew McNamara on 1st December 2009. The McKenzie Friend however was required to sit behind the party litigant, Mr McNamara. A solicitor, commenting on the case this morning noted the party litigant was opposed by Senior and Junior Counsel acting for Tods Murray, who also had at least two additional solicitors with them in court. He said "I think anyone who has to sit as a party litigant in open court, faced down by two sets of opposing counsel and supporting solicitors would by any reasonable person be viewed as suffering an imbalance in their representation. I would have to question why in the circumstances reported, the McKenzie Friend was not allowed to sit beside the litigant who requested and clearly required assistance." Lord Hamilton‘s misinformed letter to Holyrood. The Lord President’s letter to Holyrood’s Petitions Committee, used by opposing counsel in the Tods Murray action to challenge a McKenzie Friend request, alleged that McKenzie Friend sat behind litigants, citing paragraphs from Lord Gill’s Civil Courts Review. However, Lord Hamilton failed to back up his claims with written evidence or case references in his letter, which stated : "As you will be aware, this expression, which owes its origin to English procedure, can be used in two senses : in its original sense it referred to an individual assisting a party litigant by sitting he hind him or her in court and assisting that litigant by making notes, helping with case papers or quietly giving advice on the conduct of the case, as well as providing moral support in court (Civil Courts Review, Chapter 11, para 42). The only problem with Lord Hamilton’s reference to the Civil Courts Review, Chapter 11, para 42 is that no such reference to McKenzie Friends sitting behind litigants actually exists anywhere in the report. Lord Hamilton referred to Lord Gill's review, adding references which do not exist. A senior official from one of Scotland's consumer organisations said this morning : "I am troubled by the report from the court that counsel for the pursuers opposed the party litigant's request for a McKenzie Friend apparently going on to argue that if a McKenzie Friend were to be granted it must be under the terms of Lord Hamilton's letter to the Scottish Parliament which states that McKenzie Friends must sit behind the party litigant they are there to assist". "I feel I must point out to your readers that despite Lord Hamilton's claims in his letter to the Parliament that Lord Gill's Civil Justice Review referred to the practice of McKenzie Friends "sitting behind" party litigants, citing Chapter 11, Paragraph 42 of the Civil Courts Review, there is for the avoidance of any doubt, no mention anywhere in Lord Gill's report of a McKenzie Friend sitting behind a party litigant." A Scottish Government insider today said he was concerned that Lord Hamilton's ill judged references to McKenzie Friends "sitting behind" party litigants might have established a false pattern for the Scottish Courts to follow, giving further grounds to campaigners, including myself, who claim that Scots party litigants are denied a fair hearing when their McKenzie Friend is forced to sit behind the litigant, while opposing counsel have no such restrictions placed on their support staff and accompanying solicitors. He said : "Clearly the Lord President has erred in his letter to the Petitions Committee, and as such this error has given rise to a number of questionable decisions in the Scottish Courts over where a McKenzie Friend should actually sit." He went on : "Given this second case, where again a McKenzie Friend was required to sit behind a party litigant, there is a clear & present need for formal guidance to be issued to all courts on the consideration of McKenzie Friend requests, otherwise the feeling will remain that Scots are being denied the same access to justice that unrepresented court users in the rest of the UK are entitled to receive in terms of courtroom assistance." McKenzie Friends in England & Wales, are treated as a Human Rights issue, as opposed to the current practice in Scotland, where a litigant’s request for a McKenzie Friend is handled at the discretion of individual courts. 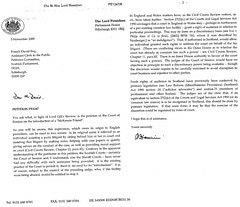 Lord Hamilton and the Scots legal establishment would rather that McKenzie Friends requests continue to be handled on a case by case, discretionary basis, but such a system clearly impedes the right of an individual’s access to justice as we have recently witnessed where the court wants McKenzie Friends sitting anywhere but next to the person they are there to assist. As far as I can tell from my own research, McKenzie Friends sitting behind party litigants just doesn't happen, anywhere, so the Lord President has some explaining to do on why he chose to inform the Parliament that McKenzie Friends sit behind is the case when it is most certainly not the case in jurisdictions where McKenzie Friends are allowed. Further, since the Lord President’s letter to Parliament has been used by counsel opposing court users McKenzie Friends requests, a clear statement must now be made by the Lord President on his reasons as to why in Scotland, we must make do with back seat McKenzie Friends, rather than the front seat variety enjoyed by the rest of the world …. The Lord President’s office has so far refused to reply to enquiries on the content of his letter to Holyrood’s Petitions Committee amid mounting claims he misinformed Parliament over the application & use of McKenzie Friends in Scotland’s courts ….